Insights for ArcGIS, the web-based data analytics workbench, is now available for ArcGIS Online in addition to ArcGIS Enterprise. Using interactive linked cards, you can analyze data and make new discoveries about your spatial and nonspatial data. Linked cards allow you to click a map or chart and see related data highlighted on another card. Insights for ArcGIS allows you to save time by performing iterative and exploratory data analysis without having to manually track your analyses. Insights automatically records your analysis workflow so you can clearly communicate how you arrived at your conclusions. 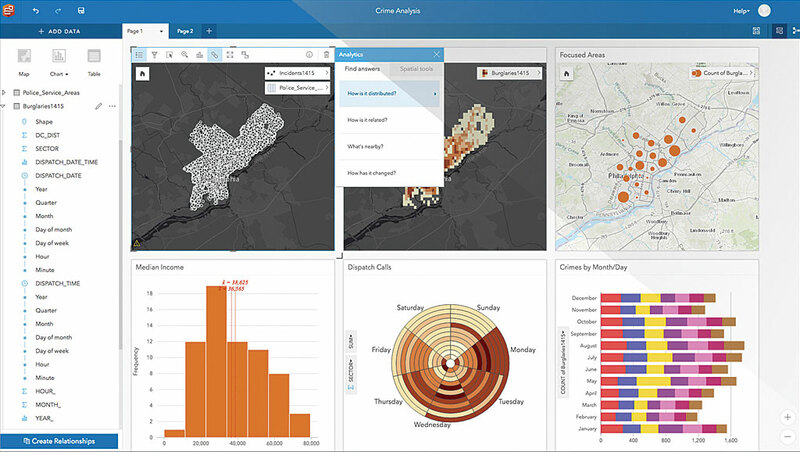 The analysis view in Insights for ArcGIS breaks down the workflow—data, filters, and analyses—so you and others can run it again to solve other problems. Easily publish analysis results within your organization. Insights for ArcGIS leverages the power of the ArcGIS platform to offer you flexible deployment, the means to level up your analysis, and share your results more broadly. For more information, visit esri.com/insights.